Gastropoda have a unique feeding structure called a "Radula" a special cartilage type structure lined with tiny teeth that the snail uses for rasping and scraping food from rocks etc. Snails grow their own shells by depositing a calcareous material along the periphery of the shell opening. 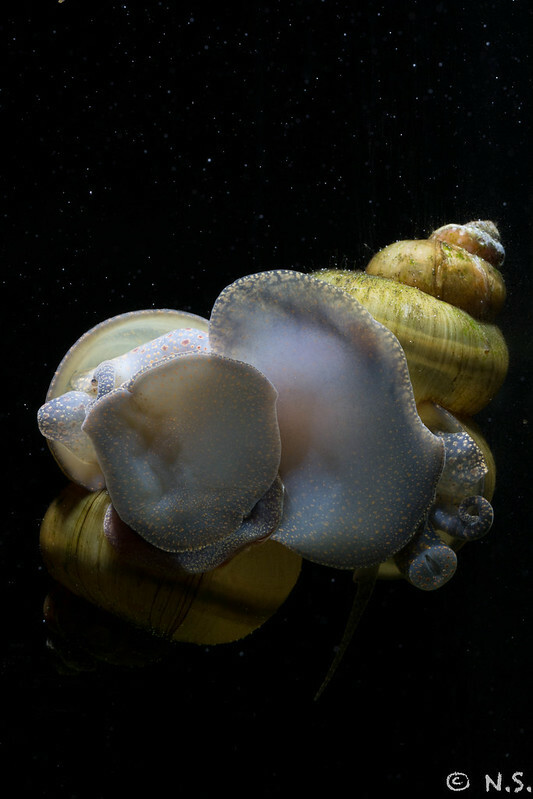 Snails move by producing a waterproof mucus lubricant under the flat part of their foot and by using a series of muscle contractions allows them to "Slide" across the surface of the substrate. Gastropods play an important role in the freshwater ecology by breaking down dead animal and plant matter. fresh water snails are mainly scrapers, and scavengers some might be predators as well. These snails can be found in a wide range of still and flowing waters, from coastal to inland streams, rivers , pools ,billabongs and dams throughout Australia. Freshwater snails can be collected from weed and algae beds in shallow still water and from the soft muddy bottoms of flowing waterways. Several species of Australian freshwater snails can be found living in temporary pools in the central parts of Australia. They are thought to be able to withstand short periods of drought by burrowing under the silt and secreting a calcified plug known as an 'Epiphragm" to seal the opening of their shell to save moisture. Some freshwater snails are omnivorous, but most are herbivorous , grazing on plant material and detritus. They are especially fond of algae film coating on submerged surfaces.. Many Gastropoda are 'Hermaphrodites" having both male and female reproductive organs They produce eggs that are typically laid in a gelatinous mass attached to the substratum. however a small number of species do bear live young. Notopala River Snails are native members of the family "Viviparidae" and are predominately found in the Northern Tropic areas of Australia. Their distribution include the drainage basins of North and Central Australia and most of the S.E areas of Queensland and N.S.Wales. Notopala inhabit rivers, permanent water ,billabongs and can also be found in short lived water holes. They are usually collected from along the banks of the water way, under logs , rocks and in the mud on the bottom. They are thought to be able to survive short periods of drought by burrowing and sealing the shell opening. Notopala snails have an inverted cone shaped shell, ranging in colour from brown to a greenish brown can have darker spiral bands. With the limited Genetic divergence and lifestyle of these animals , suggest that the Notopala species possesses very limited dispersal. Many are confined to a very small range or even one single waterway. The body of this animal is similar to other snails but has a prominent snout , short eye storks on the outside of the tenticles. As filter feeders the Notopala feed on bacteria suspended in the water and also grazes on bacterial "biofilms" that occur on hard surfaces in free flowing water, They are also good grazers grazing on algea growing on any submerged surfaces. There is an amount of confusion as to the number of species of Notopala in Australia The genus is currently under review. preliminary studies estimate that the number of species could be around 18 .The Australian Faunal Directory lists 12 species and sub species..
Dave Wilson from ********* provides the following information for the keeping of these animals. Waterhouse Snail (Notopala waterhousei) The water quality for these snails does not appear critical but they do appear to fare better if the water is a little hard. They also do not toerate low dissolved oxygen levels , this is never a problem in a well run planted aquarium. In some of his very soft water ponds they have difficulty producing shell. the snails do well eating bacteria slime and algea growing in aquariums and do very well in aquariums with plenty of detritus. DOES NOT EAT LIVING PLANTS! Essington Snails ( Notopala Essingtonensis) The water for these snails needs to be hard and alkaline suggest PH of 7.5 to 8.0, and a hardness of about 200 ppm They eat bacterial slime and periphyton and detritus in aquariums. The snails do very well with detritus as long as the water is hard, If the water is soft or acid their shells erode. like its larger relative it DOES NOT EAT LIVING PLANTS! hides during the day and ventures out at night to feed.